Hey, Clark Kent and Django. 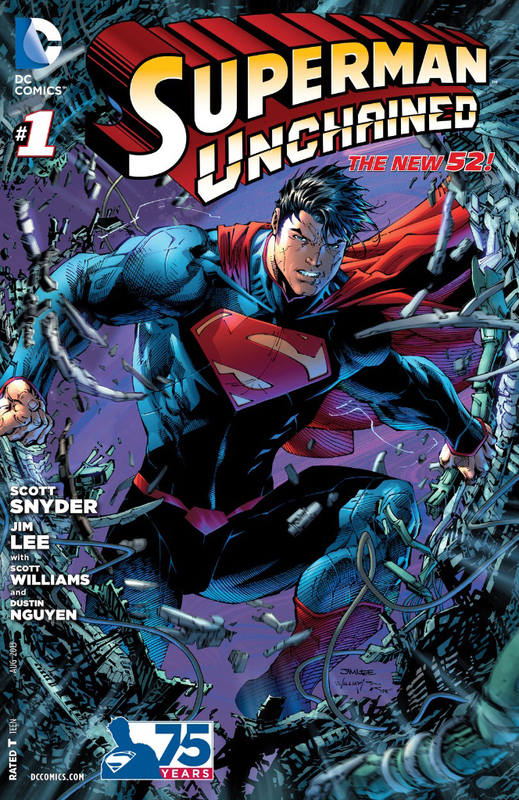 Now I know issue two of this series is already out, with a brilliant building scene that may stand or fall as one of the best Superman moments ever, but for me this is still my pick of the month. 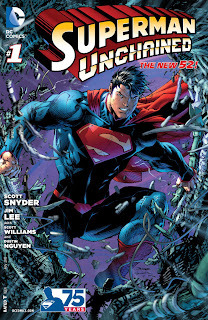 Not only have writer Scott Snyder and artist Jim Lee delivered a blockbuster matching comic with Superman Unchained #1, they created the Superman the DC52 (nay any DC universe) needed as well. This issue humanises Clark in old yet fresh ways, forming the perfect jumping on point or faith restorer in the process. Now, you could argue taking one of the hottest writers and artists in comics and pairing them with the medium's greatest icon could only result in such, but pride has come before a fall before. Even handling Clark Kent. With the absence of the JSA in the rebooted DC, the publisher has distanced itself from telling tales of the World Wars to a new target audience who relate more to recent conflicts. Starting this tale with the bombing of Nagasaki, sets the future threat level at a 'this is a job for Superman' high, and feels like a DC once again back to telling great Man of Steel stories people of all ages can connect to. As satellites rain from the skies, in the present day Superman works hard to save the team trapped upon one of them. Having saved six already, we go behind Superman's cool exterior and become privy to Clark's monologue in a crisis. Reminding himself to reassure the astronauts, stressing over how to handle the onboard reactor, and passing praise back to the victims after the day is saved, encouraging them to celebrate their feat. All showing why 'super' is actually an adjective in describing this 'man'. As Superman flies off, the next great touch comes into play. His supporting cast. Picking up from Scott Lobdell's stories of Clark leaving the Planet to be a Blogger of news from a human interest perspective, Superman hears Jimmy in his ears, contacting 'Clark' over what's on the newswire. 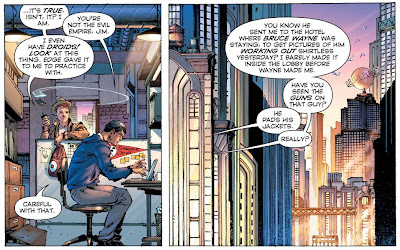 This gives Jimmy more purpose, and explains how Superman stays updated while in the field. Then of course there's Lois Lane. Like the movie Man of Steel Lois, Scott's take is a woman in control of herself and the almost the Daily Planet. Smart and a challenge for Clark Kent, she highlights his error; Superman saved all eight satellites. He did?! Well that is news to Kal-El. Setting out to find the mystery man or woman that he's unknowingly absorbed the credit for, if Clark thought the Daily Planet was the 'evil empire', wait till he gets a load of this one, complete with a 'Lane' whose explosive secrets may be better left uncovered. 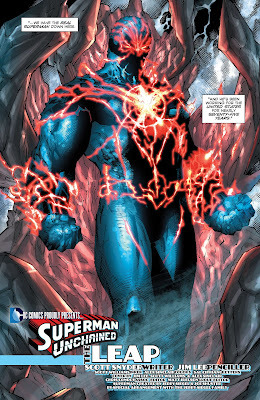 Jim Lee, paired with his unrivalled inking buddy Scott Williams have altered their take on Kal-El since handling writer Brian Azzarello's run on Superman, and Unchained feels fresher for it. Infact this is some of Jim Lee's career best - defining why he has inspired generations of people to pick up a pencil. Scott, the same, only with ink, shows the duo's art is not as heavy as their former run. Mind you the tale isn't either. The Dustin Nguyen drawn prelude slows down the pace from the prior page's momentum, but never the quality of the ride. In two pages Scott finishes fleshing out Perry White, positioning him has the soul of the Planet, and potentially the one to connect the mystery at the start of this issue with the repercussions at its end. 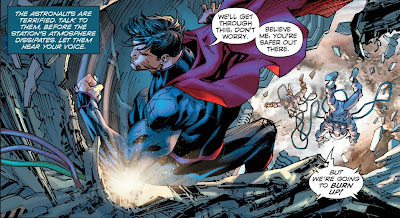 With its Justice League creative team, Superman Unchained is not only a book in the hands of master watchmakers, ticking away to something truly explosive, but a book you can shove under a non-comic reader's nose, and say 'Here try this!' And isn't that the whole point? Wow. Even the plot sounds interesting. And I like the dialogue snippets there. Thanks Dan. Maybe I've found a Superman book I can actually read. I'd say so Random. I think you can tell Snyder is saying, if this is my only Superman tale, it's gonna be everything I want to say on the character. Luckily, making characters fly has always been his strong suit. Hopefully this turns out to be better than horrible writing I've heard that Lobdell turns out lately. But at least this one will be a beautiful disaster if it doesn't pan out. I think it will be Dale. I don't think you have to get Superman as a writer, I think you have to get Clark. Scott sure has that box ticked and with a foe that can go a few rounds with the Man of Steel too. Boy Dan, you just said a mouthful. "You have to get Clark" So many writers forget that Clark was raised by two very human parents. Yes, he's an alien. And I'm sure he does have some very alien instincts in there. But all of his childhood memories, all of the "training", all of the teachings from ma and pa Kent were those of a human. You have to be able to write the Clark side very very well, to get us attached. Because if we do not care what he does in his personal life, or more importantly, if he does not care what he does in his personal life, then we're not going to like what he does as Superman. Exactly Random - whether continuity has Ma and Pa Kent alive isn't really key. What is, are their lessons.